In colonial days, major works on the construction and maintenance of Nigeria infrastructure were handled by foreign firms. With the approach of independence, the promoters of these firms were apparently apprehensive that a cordial relationship with foreign interests may not be taken for granted, given the militancy of the likely successors to power. In order to present a united front, seven of these foreign firms founded the Federation of Building and Civil Engineering Constractors in Nigeria (FOCI) in 1954. The seven foreign firms are Costain (W.A) Ltd, Cappa D'Alberto Ltd, Borini Prono & Company Ltd, G. Cappa Nigeria Ltd, Richard Costain Ltd, Poletti Brother Nigeria Ltd, and Taylor Woodrow (West Africa) Ltd. Subsequent developments after independence, in particular the indigenisation laws, accelerated the emergence of local participants in the construction industry. Today the organisation is a mixture of indigenous, indigenised and foreign enterprises. 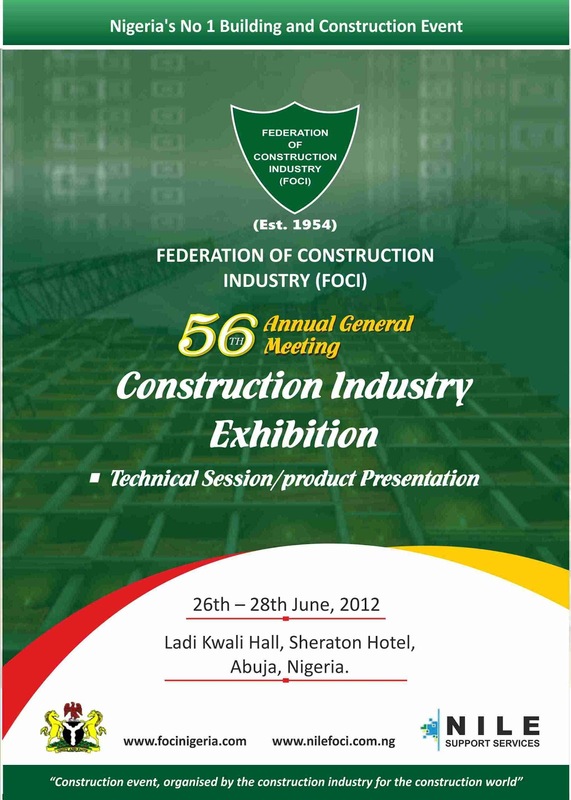 The name of the group has since been changed to the Federation of Construction Industry - (FOCI). 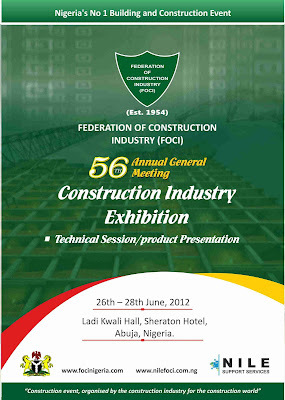 Now, this illustrious institution is set to hold its 56th Annual General Meeting(AGM)and Construction Industry Exhibition 2012 at the prestigious Sheraton Hotel, Abuja from the 26th-28th of June 2012. Interested in Exhibiting or Participating? Visit the Facebook page for the exhibition http://www.facebook.com/nilefoci or visit the website http://www.nilefoci.com.ng to learn more and register.